This is an excerpt from this week’s premium update from the The Financial Tap, which is dedicated to helping people learn to grow into successful investors by providing cycle research on multiple markets delivered twice weekly. Now offering monthly & quarterly subscriptions with 30 day refund. Promo code ZEN saves 10%. The bullish case prevailed, in the end the prior Cycle high provided only minimal resistance. It was able to contain crude for just 4 days before it sliced through the Cycle highs with a massive $2.50 single session surge. At this point, I can only maintain my prior stated position that Cycles are not providing us with a trading edge. That statement covers both the Daily and Investor Cycle time-frames for the time being. 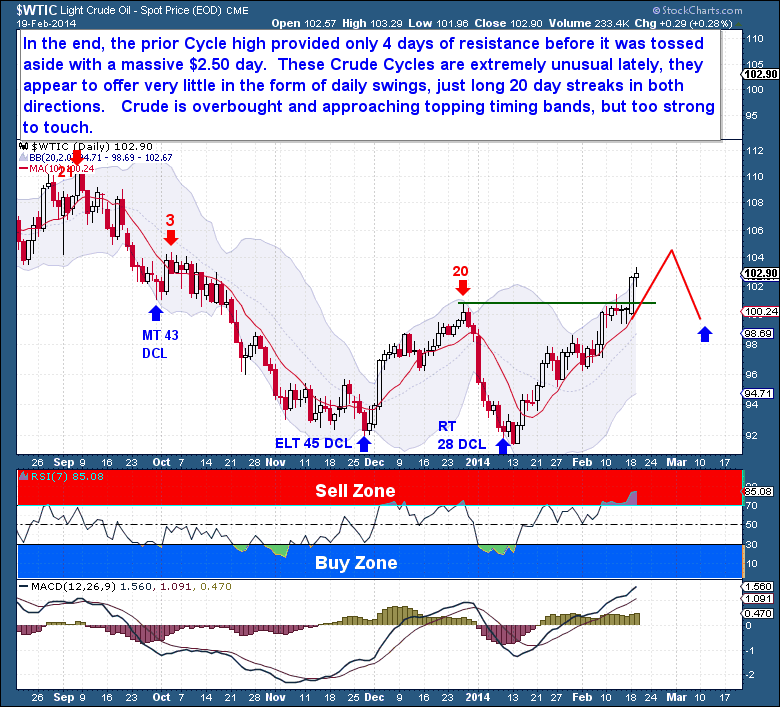 To the naked eye, the moves out of Crude appear to be “golden opportunities” to ride a powerful trend. But the fact is, these are not normal moves for crude. These Crude Cycles have been extremely unusual lately; they have offered very little in the form of daily swings but instead shown us prolonged “shutout like” 20 day streaks in either direction. Although I’m not a long term Crude bull, it looks more and more like the Cycle failure during the first few days of January are turning out to be one major bear trap. In the short term, crude still has room left to move higher with probably little resistance too. What will eventually stop this move is a Cycle that has become far too overbought while well in the timing bands for a DC top. The Daily Cycle gains have now exceeded $10 over 25 sessions and at some point soon there will be an impressive profit taking event. Volatility Is Coming, But Which Direction?